China is the world's most populous country with a fast-growing economy that has led it to be the largest energy consumer in the world. Fossil fuels, particularly coal, continue to be the leading source of electricity generation and installed capacity. Subsequently, CO2 emissions and air pollution is a severe problem China has been faced with. 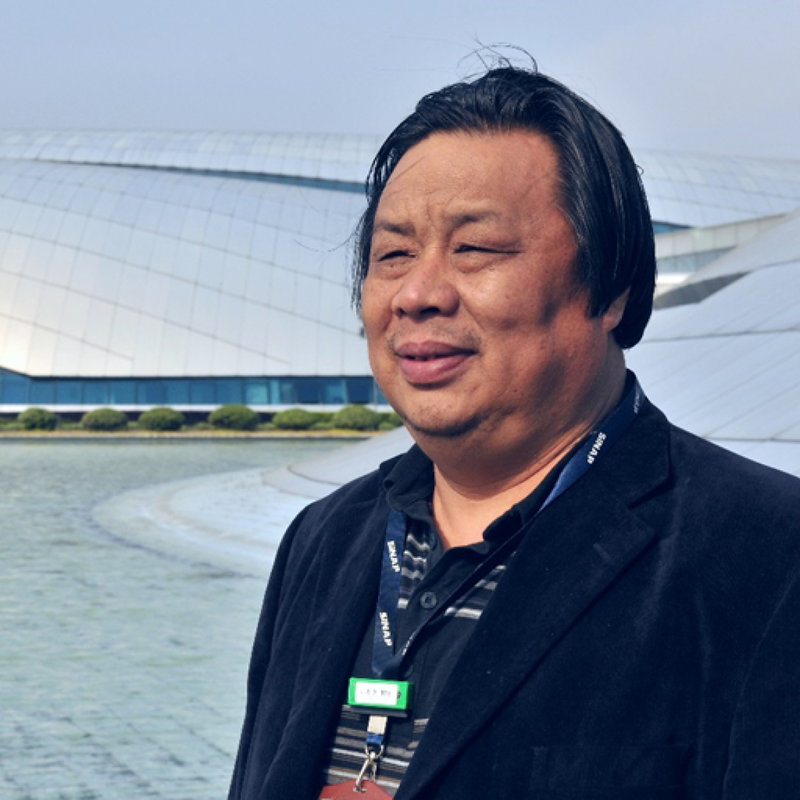 It is a half-century dream for China to develop Thorium based MSR. MSRs can be divided into two main subclasses: Liquid Fueled MSR (MSR-LF) and Solid Fueled MSR (MSR-SF). These types of reactors can achieve excellent performance on safety and economy with a high temperature output. Furthermore, the MSR-LF system together with dry reprocessing process is particularly suitable for the use of thorium fuel. Recently, research on MSRs has drawn fresh attention around the globe. The MSR-LF and MSR-SF have characteristics and applications including thorium energy utilization, hydrogen production at a high temperature, water-free cooling and small modular design. These properties make MSR one of the best approaches to solve the energy and environment issues of China. In January 2011, the Chinese Academy of Sciences (CAS) launched the Thorium Molten Salt Reactor (TMSR) nuclear energy system research program as one of the five Strategic Pioneer Science & Technology Projects to meet China’s major strategic needs. In 2013, the National Energy Administration included the TMSR project among the 25 “National Energy Major Application-Technology Research and Demonstration Projects” in its “Plan of Energy Development Strategy”. 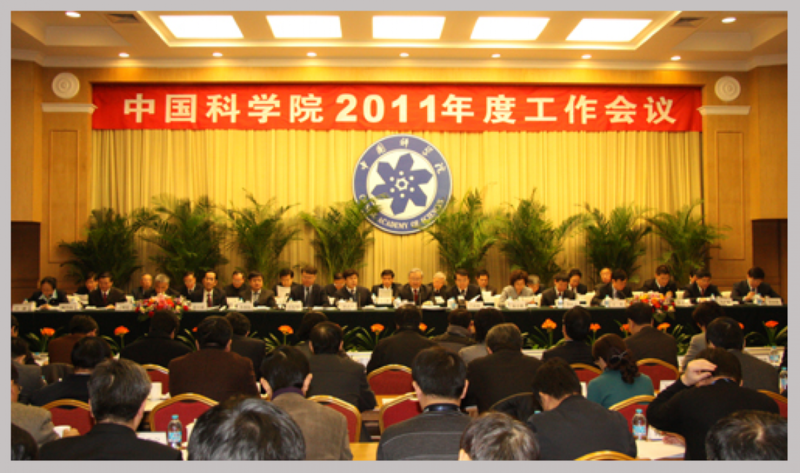 In 2014, the local government of Shanghai launched a major TMSR project to support the TMSR technology development. 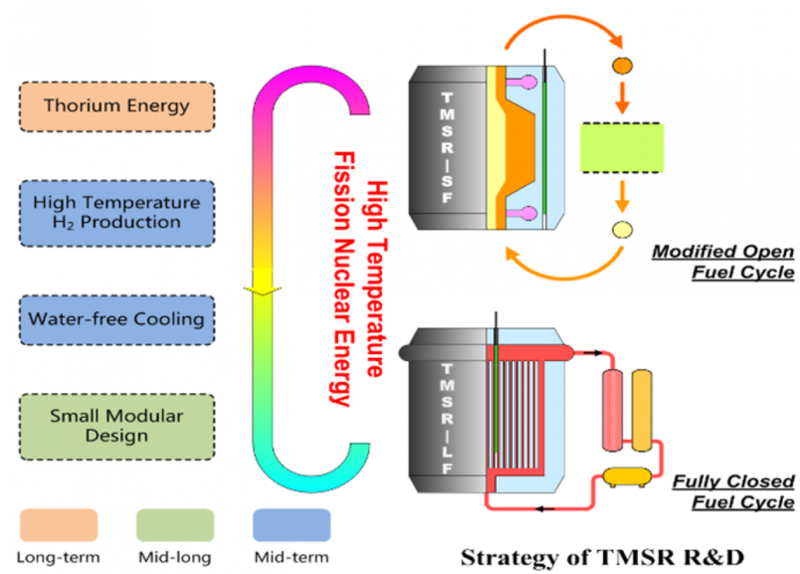 The TMSR project intends to solve major technological challenges in thorium-uranium (Th-U) fuel cycle and thorium-based molten salt reactors, and to realize effective utilization of thorium and composite utilization of nuclear energy in 20-30 years. The validation and implementation of the TMSR program will provide a feasible solution to ensure national energy security, promote energy saving, and reduce CO2 emissions in China. The goal of the Early Stage is to master the key technology and obtain the equipment manufacturing capacity of TMSRs. This phase covers the TMSR design capability, R&D of molten salt manufacture and loop technology, R&D of the front-end and back-end of the Th-U fuel cycle, R&D of high-temperature durable materials, and R&D of safety standards and licensing. During the Early Stage, the first 10MW th solid-fueled molten salt test reactor (TMSR- SF1) will be constructed and will realize full power operation. 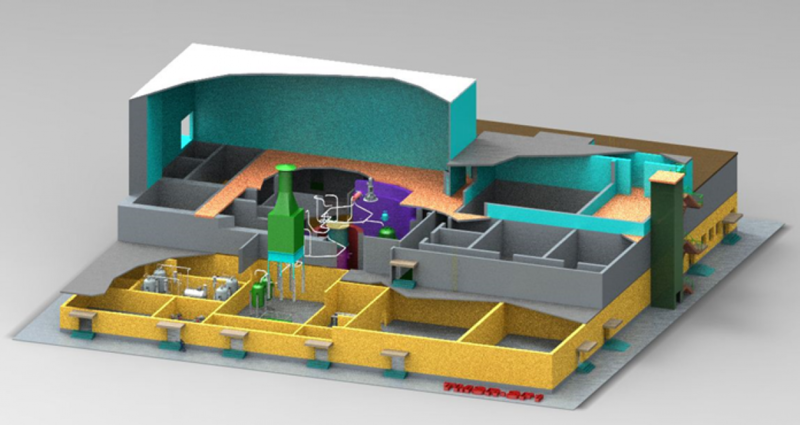 The first 2MW liquid-fueled molten salt experimental reactor (TMSR-LF1) with pyro-process function (trace level) will also be constructed and reach criticality. In the Engineering Experimental Stage, the main goals are to construct a 100MW solid-fueled TMSR demonstration system (TMSR-SF2) and a 10MW liquid-fueled molten salt experimental reactor (TMSR-LF2) with pyro-process function. In the Industrial Promotion Stage, the commercialization of the TMSR-SF will be promoted step by step, based on the R&D foundation from the previous stages. Utilization of thorium in MSRs can be realized step by step depending on the fuel cycle modes and related technology development. TMSR-SF can be operated in once-through fuel cycle for simplicity. In principle, thorium utilization can be realized in the TMSR-LF with the modified open or even fully closed fuel cycle. The TMSR project has carried out research work and achieved some results in key technologies including conceptual designs of experimental TMSRs, development of fuel reprocessing technologies, establishment of experimental platforms, and theoretical researches. Foreign cooperation has progressed steadily. The TMSR center has productively cooperated with the American Nuclear Society (ANS) in setting the safety standards for the TMSR-SF, and with the American Society of Mechanical Engineers (ASME) in setting the material processing standards for high-temperature reactors. A set of methods and tools for the design and analysis of the TMSRs has been built. Preliminary analyses of thorium utilization in commercial scale TMSR-SF/LFs were carried out under the optimization of core geometry and fuel management. The analysis shows that TMSR-LF has favorable characteristics to realize thorium utilization in a thermal spectrum by combining with on-line removal of the fission products and on-line separation of 233 Pa to improve the conversion ratio. TMSR-SF can use small amounts of thorium compared to TMSR-LF. However, it is possible to improve the burnup and the thorium utilization in a TMSR-SF by introducing in-operation fuel pebble recycling. Based on the TMSR design platform built so far, the design of the 2MW TMSR-LF1 and the world’s first 10MW TMSR-SF1 has begun. The goal of the TMSR-SF1 and TMSR-LF1 is to realize the integration, construction, operation and maintenance of the TMSR system, verify the physical behaviors, thermal-hydraulic and intrinsic safety characteristics, and provide a comprehensive experimental platform for the design of future demonstration and commercial reactors. Due to lack of mature equipment, the TMSR research team has focused attention on this issue, and successfully developed a high-temperature molten salt pump, a molten-salt-to-air exchanger, molten salt frozen valves, and other key equipment. A series of tests has been finished, including an equipment performance test, loop technical identification, a heat transfer experiment, and a test of the compatibility of the salt with nickel-based alloy. In particular, the system design, construction, and operation of a Nitrate Salt Forced Circulation Loop, a FliNaK Experiment Loop and a Nitrate Salt Natural Circulation Loop have been accomplished. Research on thorium based fuels has achieved some progress. Standards for inspection and quality control of thorium fuel are under investigation. The trace boron determining method was developed based on ICP-OES analysis with detection limit of 0.2 ppm. High quality ThO2 and ThF4 were prepared with the total equivalent boron content being less than 4 ppm. Analysis procedures for more than 40 trace impurities in ThO2 and ThF4 powders were established. For solid fuel fabrication, the preparation of ThO2 kernel particles by using the sol-gel method was successful. Preliminary compatibility tests of graphite matrix of TRISO spherical fuel element with fluoride salt were carried out under the operation conditions designed for TMSR-SF. It indicated that the mass change of the fuel matrix were negligible. For liquid fuel fabrication, the produced fuel salts have been purified by being bubbled with HF-H2 mixture gases. A 5kg grade purification equipment was developed and the HF-H2 process was successfully conducted in this equipment. The FLiNaK product showed a good compatibility with the reactor alloy materials. The oxygen content in the FLiNaK product determined by LECO oxygen analyzer was below 100 ppm. ​A process flow sheet for the TMSR fuel cycle has been designed. The goal of this flow sheet is to separate and recycle the most valuable UF4 and carrier salts on-line using pyroprocessing techniques. The fluoride volatility method (separation of U) and low-pressure distillation (separation of LiF and BeF2) are the crucial ones in the above-mentioned flow sheet. Such a process not only reduces the intensity and difficulty of on-site fuel processing, but also recycles precious 7LiF in time to reduce the inventory on-site. The research focuses on the above two methods as well as on electrochemical separation because of its versatile applications. For the fluoride volatility technology, a pathway has been determined that includes IR spectroscopy to monitor the process, an absorption method to purify the products, and gradient condensation to collect the volatilized UF6. A series of experiments has proven that UF6 can be recovered using the fluoride volatility process from UF4 powder or eutectic UF4-FKZr, which is similar to true fuel system, and the recovery ratio of U is over 95%. For distillation technology, kilogram-scale distillation of FLiNaK was performed at a horizontal distillation facility with a large evaporation surface. The evaporation rate of FLiNaK reached 1 kg/hr, and the collection efficiency was more than 94%. It suggested that the application of low-pressure distillation for purification and recovery of the carrier fluoride salts is feasible. Furthermore, the factors that affect the collection efficiency and the purity of the recovered salt were identified. The progress of electrochemical separation concentrates on separation of U and Th from various molten salts. The reduction sequences of REs, U, and Th in some kind of molten salts have been determined. At the state of the art, the recovery ratio of U in LiF-BeF2 is over 92%. A parallel electrolysis recovery of U in LiCl-KCl achieved a recovery ratio of over 98%. Electrolysis of LiCl-KCl-ThF4 is also conducted, where the recovery ratio of Th is over 90%. The Ni-based alloys are considered to be the primary option for metallic structural materials in TMSR, after discussing several candidates. A high-temperature Ni-based alloy (GH3535) has been developed and its conventional performance parameters have reached those of Hastelloy N alloy made in the US. The small-scale and pilot-scale production of GH3535 alloy has been completed and the technology for mass-production has been established. 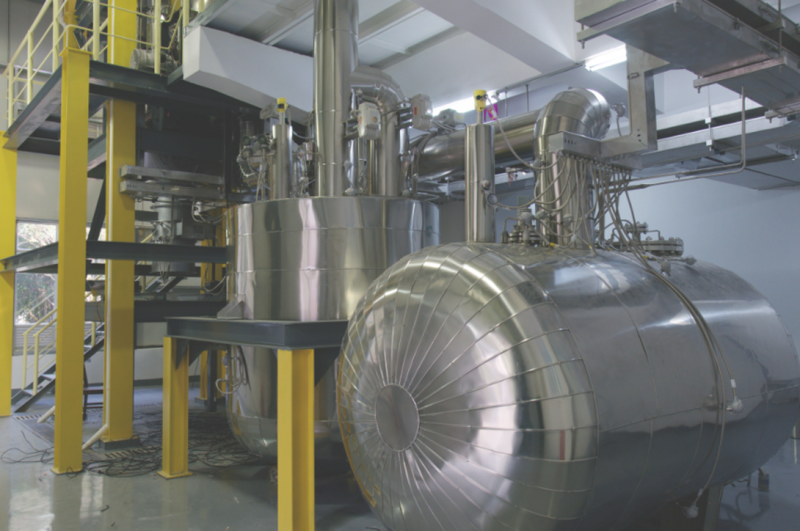 Furthermore, the TMSR team has developed plastics-processing technologies of nickel-based alloys, e.g. the hot extrusion and rolling process technology of large-caliber pipe for reactor primary loop as well as the TIG welding technology for thick plates that meet the requirements of ASME-NB. The accumulation of these key technologies ensures the successful application of GH3535 alloy in reactor vessel, loops and control rod sleeves of the first TMSR. To meet the demand of the neutron reflector, the TMSR team has improved the fabrication technology of isostatic graphite. The first nuclear graphite NG-CT-10 has been jointly developed and will be ready for mass-production in 2015. Furthermore, a super-fine grained graphite (NG-CT-50) with the dimensions of D400 × 400 mm3 has been developed in order to meet future requirements. This graphite possesses high density, high graphitization degree and other excellent properties such as high bending strength, high compressive strength, low porosity, small median pore diameter (740 nm), and low boron content (<0.05 ppm). It shows that the newly developed nuclear graphite could effectively reduce the leakage of high energy neutrons from the core. The irradiation experiments for nuclear graphite will also be carried out in months. This radiation data enables scientists to understand the mechanism of radiation-induced degradation of materials and confirm the safety of TMSR during its lifetime. The first nuclear graphite NG-CT-10 has been jointly developed and will be ready for mass production in 2015. In 2015, joint design with other corporations in China will be promoted to perform the engineering design of TMSR-SF1. The engineering prototypes of nuclear grade equipment will be developed in cooperation with the equipment manufacturers. A Cooperative Research and Development Agreement (CRADA) between TMSR and Oak Ridge National Laboratory (ORNL) was officially signed, where the technical support from ORNL will be beneficial to the TMSR project. Cooperation with MIT and INL will also be promoted in 2015. An electrical heated mock-up of TMSR-SF1 (TMSR-SF0) is planned to be constructed, where the components to be designed, manufactured, and built are prototypes of the TMSR- SF1 components. It is suggested that this mock-up could act as a benchmark of FHR for verification of some parameters and analysis code. It will also support the LICENSE application and technical research. Research on fuel preparation is expected to proceed. For TMSR-SF1, work on fuel permission application is required. This includes research on techniques for fuel accounting and preparation of license documents. 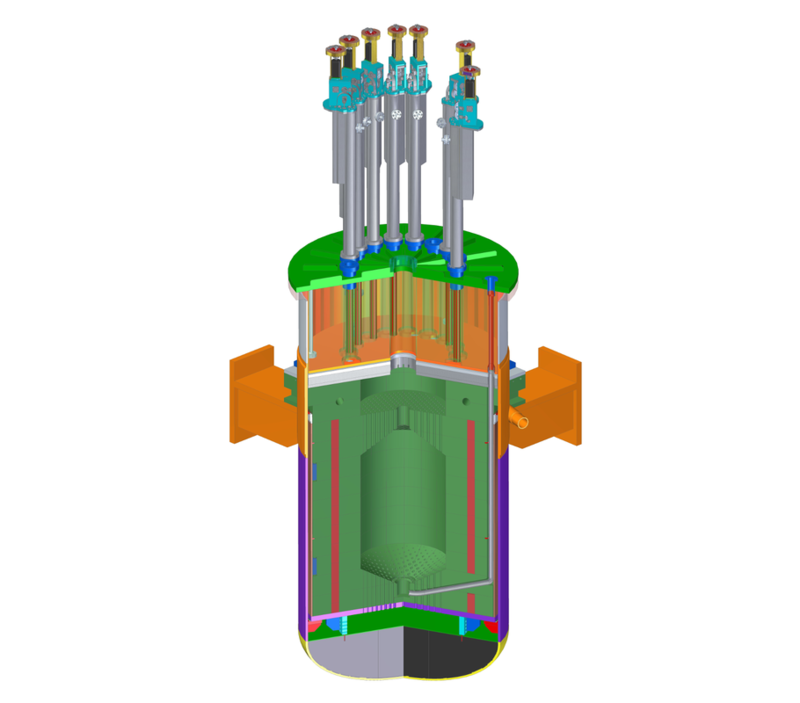 Systematic compatibility tests between spherical fuel elements and fluoride molten salt will be conducted, and conclusions will be drawn after data analysis. Theoretical analysis of the fuel performance under operative and accident conditions of the reactors will arrive at a conclusion. For liquid fuel, further improvement is needed to the preparation process of ThF4 to reduce its impurities, especially carbon and fluorine. Small batches of fuel salts will be synthesized using HF-H2 purification process. The behavior of oxide in fuel salts will be studied to obtain the oxide tolerance of the fuel salts, which is crucial for reactor safety. Otherwise, the physical properties such as density, thermal conductivity, and viscosity of the fuel salts will be measured experimentally. The research on pyroprocessing techniques will focus on FLiBe eutectic system, which is a coolant and carrier salt for molten salt reactor. Based on the experimental data, a systematic evaluation of the designed flow sheet for the TMSR fuel cycle, including feasibility and safety, will be performed. The research on structural materials will be dedicated on completing the large-scale production of GH3535 alloy and full size graphite NG-CT-50, thus to meet the needs of the TMSR-SF1. Moreover, the conventional and radiation properties of both materials will be evaluated to obtain the allowance for their applications in TMSR. In addition, the development of materials used for next generation of TMSR, such as a new type of high-temperature alloy, SiC/SiC composite and high-density nuclear grade isotropic graphite will also be carried out. China’s dream to develop a thorium based MSR is half a century old. China initially launched TMSR research in 1970s, but it was terminated due to technical restrictions. At the beginning of this century, research on MSRs has drawn fresh attention around the globe. The MSR-LF and MSR-SF have characteristics and applications including Thorium energy utilization, hydrogen production at high temperature, water-free cooling and small modular design. These properties make MSR one of the best approaches to solve the energy and environment issues of China.